This recipe comes from my new-favorite book, Heal Local by Dawn Combs. It’s a book centered around 20 homegrown or regionally sourced herbs that you can use to build a complete home apothecary. I can’t even begin to describe how useful I’ve found this reference to be in the past month that I’ve owned it! Besides giving detailed descriptions of each herb, the book is further broken down into sections for naturally treating emergency first aid and common illnesses with your homemade remedies. Tucked throughout the pages and paragraphs are great little recipes for everything from heartburn lozenges to headaches pills to this liniment for varicose veins and muscle pains shared below. Dawn also writes a column called The Prescription Gardener at Hobby Farms you may enjoy reading. You can learn more about her Herbal Institute and Ohio farm at her web site, Mockingbird Meadows. She’s a kindred spirit, so if you like my stuff, I think you’ll love her! This recipe is given in parts. That means that you can scale it up or down depending on how much you want to make. It doesn’t have to be precise, at all. You really can’t mess up this recipe by putting a bit more of one ingredient than another. I used pinches, but you can use a measuring cup, tablespoons, small food scoops or whatever you’d like. Place equal amounts of yarrow, calendula and St. John’s wort in a glass jar and then add the smaller amount of cayenne or ginger. You can use whole dried pieces or ground spice. This liniment can be used for varicose veins, muscle pains, strains and aches. Use once in the morning or evening, or at both times of day. Always rub it towards the heart to help tighten and tone varicose veins and improve blood flow. Isn’t that a great recipe? I’ve been using it on my family and it really is effective. A peek at the inside of the book. This blog contains affiliate links to Amazon, Mountain Rose Herbs and Bramble Berry. That means if you click on one and make a purchase, I earn a small commission for sending a customer their way. This doesn’t cost you any extra, but does help to support my blog and lets me keep doing what I do. Thank you! I’d love to learn more about the uses of Yarrow! Thank you for sharing! I would love to learn more about Calendula. Definitely trying this recipe! I would love to learn more about plantain. Thank you for sharing all your recipes! Love all the info you send out! Thank you! I’d love to learn about stinging nettle! Thank you for sharing. Would love to win your book! I love books and love learning about herbs. I would love to learn more about bee balm. Hope I win! i grow several medicinal plants, and I’d love to learn more about how to use them: borage, calendula, sage, melissa, chamomile, comfrey. I’d love to learn more about St. John’s Wort. This book looks amazing! Thank you, Jan. I have an herb garden going (live in Michigan) and have so much to learn that I don’t know where to begin! I think my first objective is going to be to learn how to use the lemon balm that is doing so well (besides tea!). Thank you for sharing this recipe! Thank you for sharing and giving the opportunity to win this book. Currently, I have Echinacea/coneflowers growing but would like to know if it is a specific plant of if all of them can be used for the same purpose. New to this site and love it! – I’d love to learn about more ways to use Mullein. I LOVE this recipe & definitely will be making it. I would like to learn more about dandelion. It seems you can use the for so many things. Would like to learn more about marshmallow. I’d love to learn about more ways to use wild carrot and plantain! We have a lot of Yarrow growing in our area. I’d love to learn more about that! I’d love to learn more about the uses of Sage since it grows wild in the high desert here in Montana and also about Dandelions as they take over my yard every spring. I would love to learn about herbal uses. I have a lot of violets and would love to do something with them. This book sounds amazing! I have just started my journey researching home and historical remedies. I would like to learn how to use the Purple Coneflower in my garden. I want to learn more about mullein. Thanks for the giveaway! I would love to learn more about Lady’s Mantle and Yarrow. Lemon balm is taking over part of my yard and I want to learn how to use every last stem. Thank you for sharing and Have a Fabulous Day! I would love to learn more about comphrey. It grows here in my area. I would also live to win a copy of this book! I am constantly amazed at the usefulness of common herbs. Sign me up for the book, please! I’d l8ve to learn more about the Beauty Berry and Common Mulein that is growing in my area. I have yet to make a liniment – looks like this will be my first! Thanks for sharing. I would like to learn more about Motherwort. I am growing calendula and would love to learn about more ways to use it. Thank you for the recipe and the giveaway! I will definitely try this one out. Would love a chance to get the book. Wanting to learn more! I would like to learn more about plantain. Would like to learn more about yarrow and mullein. Looks like a cool book. I have started making salves and tinctures so this would come in very handy! Thank you. I’ve seen Lemon Balm around and would love to learn how to incorporate it in daily life. Thanks for a chance to win Dawn Combs’ awesome book! I would like to learn more about mullein; it grows all over the place here and I remember it’s a good medicinal but I don’t know for what it’s good. Also Lamb’s Quarters, if you have time. I would love to learn how to use lemon balm. I’ve just hung 12 bundles to dry and now need to know what to do with it. Thanks for the chance to win this book. It looks fantastic. I would love a copy of this book. I have grown herbs and medicinal flowers and plants for over 10 years. Im always interested in the practical application of them. I love your site and turn to it all the time. 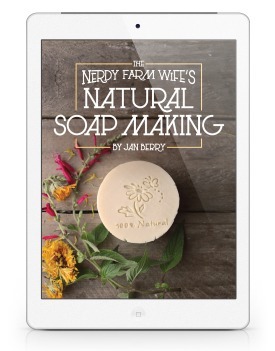 I just made your hot process oatmeal and honey soap last week and it is wonderful! You provide so much information and I really appreciate it. Thank you! Now, I live in middle TN and would love to know about ways to use queen anne’s lace and would really like to know also if there is a use for curly leaf dock and pig weed. Goldenseal is a native herb that grows locally (in a friend’s front forested yard and has offered to share some come fall dividing time!) that I would love to learn more about. The ‘sunny’ plant and herb Calendula and dandelion fascinate me with their potential uses and I’d love to learn more about how I can use them. I would like to know more about Plantain. I would like to learn more about yarrow. I am interested in the book and really appreciate your review of it. I want to know more about yarrow, calendula and so many other herbs. It’s a big herbaceous world out there! Echinacea is growing in my garden, not only is it pretty, I would like to learn a way to use it!! Love your site. Thanks for sharing your work. I would love to learn about St. John’s wort and burdock root. Oh my how can I pick only one? I would like to learn more about elderberry and plantain. Thank you for all the great information you share!! Thank you for the recipe, and I’d love to have a copy of your book! I would love to learn more about turmeric please. I would love to learn more about various “weeds”, like dandelions, plantain, and chickweed. I also would like help with identification. I would love to win this book! What a wonderful idea for a book — to use locally available herbs to make alternative health care products. I would love to learn uses for Kudzu which grows in abundance here. Thanks for the recipe! I would love to win this book and am interested in learning more about St. John’s wort. I would love to have this book! I’m interested in finding out more about tarragon and oregano. Thanks for having this give-away. This book looks wonderful. I just cannot get enough info on herbs. I am learning so much but it just seems like there is SO much I don’t know! I am interested in lamb’s quarters, since I have been pulling handfuls of it as a weed for years. But this year I thought “Hmmm…usually the weeds I find that resow themselves so readily (dandelions, plantain…) are super useful or edible.” So I looked & found that it is edible & figure there has to be some other uses! I would also like to learn more about using basil besides for food…we eat lots of it, but I know it has more to it. Chickory as well (besides for a coffee substitute…yech!) Thanks for all you do. Herbs make the world a healthy place to reside… Love to have your book! Would love to learn more about Honeysuckle. I show my kids how to get honey from the flower but know it must have many more properties.. I would love to win. Have you any idea of uses for the Yucca plant or sage brush? Yep I live in a dry area. What a great resource! I’d love to have this book in my pharmacopoeia arsenal! This sounds so easy, and I can’t wait to try it on my muscle aches! Thanks for being so generous in sharing your wonderful recipes with the world! I would like to learn more about Mimosa (Albizia julibrissin). Dawn wrote an article in Hobby Farm magazine about it but I would like to know more about the bark. Add me to the list for this book, if you would please. It sounds interesting and is not one I’ve seen before. I am expecting my first baby so i am new to varicose veins..i don’t like them! Thank you for this recipe!! Violet is most plentiful here in my garden; also Hypochaeris radicata “False Dandelion” – would love to know more about these helpers. Thank you. I would love to learn more about fever few and white willow bark. My daughter has terrible migraines. I would like a recipe for a rub for her head. Thank you.. 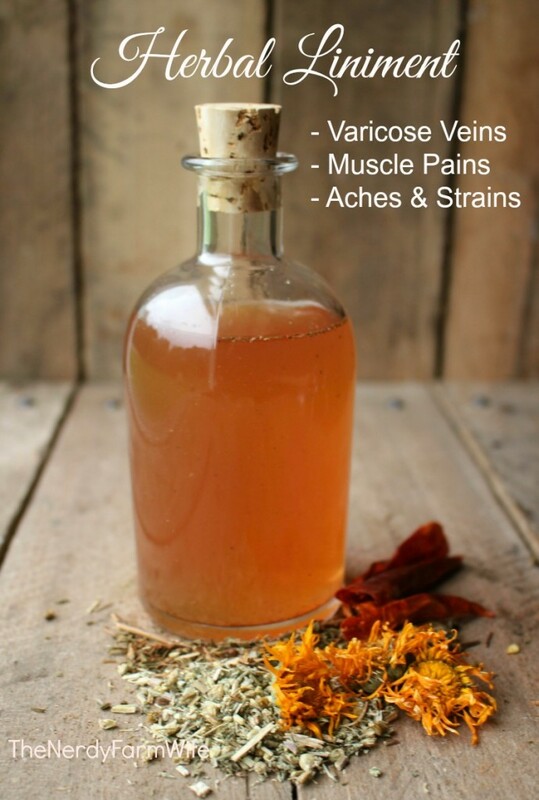 I have a huge problem with varicose veins so I would love to try this-just need to get some dried yarrow! ty! Thank you for the recipe. I enjoy your posts. Plaintain grows everywhere here in Florida and I would love to learn all I can about it! Thanks for the opportunity to win a copy of such an awesome sounding book!!! Thank you for the recipe. I enjoy making my own salves and natural cures with essential oils and herbs. Just recently I learned how to make a wonderful plantain salve and made up a batch. I would live to win the herb book! I have recently come across your website and have fallen in love with it. I have purchased some of your books for my Kindle and just finished reading the one on Lemon Balm. Currently I have a batch of Lemon Balm, from my herb garden, hanging as we speak. I am anxious to make Lemon Balm Tea and cannot wait to incorporate it into some of the many recipes that you wrote about. Having always been a wanderer of nature I am constantly curious about the things that can be made from what I surrounded with. You have been a great inspiration….Thank You!!! I really enjoy reading about different uses for plants and their helpfulness in healing. Have made some soaps to help with dry skin. Would like a copy of this book! Great recipe. This book looks wonderful. I would love to learn more about anise-hyssop and how to use it. I planted some last year by my front door and it’s become as large as a small tree! would love this book, would like to expand my knowledge of the use of herbs and flowers as well as oils. What a wonderful opportunity to receive such a book for our daily use. Looks informative. Can’t wait to see if I win! I’d love to learn about uses for chamomile, rosemary, lavender. I would love to win this book and learn more about the benefits of herbs. I just made up the liniment. My first liniment ever. Thanks. I have suffered worth anxiety attacks for over 30 years. Traditional meds don’t always work. I’d love to know, how to use lemon balm to aid me. Thanks! I’d like to know more about St. John’s Wort and Valerian. This is very interesting. I started checking into natural cures a couple years ago when I made myself a Fibroid Tea instead of opting for surgery(like my Dr. recommended). I would enjoy learning more by winning the book you’ve recommended. My full time work is as a gardener so I always seem to have loads of aches and pains. This wonderful recipe is now on my list for next weekend … just need to gather a couple of the ingredients that I don’t have in my own backyard. I have used catnip and would like to learn more specifically about it, especially since it’s so prolific. Thank you for sharing this information. I’m always looking for natural home remedies. thank you for the recipe. i try to stay very active but now with getting older I am often a little stiff. would live to win the book as i am always trying to further my education regarding herbs. I would love to learn how to use herbs to treat a variety of aliments that aren’t helped by western medicine, including St. John’s Wort. Thank you for the opportunity to win the book. This looks like a fantastic book. Thanks for doing this giveaway. I would like to learn more about using sage. I would love to know more about ways to use my rugosa rose and rose hips and love a chance to win such a gem of a book. I would love to learn more about rasberry leaf and the borage which is taking over part of our property! I would like to learn more about using mint. What a wonderful giveaway. This is our first summer in our new house and I am trying to learn as much as I can from the wild plants around me (Vermont) as well as from the small herbal garden I am tending. I would love to learn more about mugwort, which I have noticed popping up around the garden. Thanks for sharing. Could fresh herbs be used in this recipe or must they be dried? Hi Fredrika! I infuse witch hazel with fresh herbs and flowers sometimes, so believe you could here too. The only drawback that I see is that the witch hazel would be more diluted from the water content in fresh plants, so it wouldn’t have as long of a shelf life. I recently found your site, and have become inspired. Thank you! I live in Alaska, and would love to learn more about Fireweed and Devil’s Club. Just found my way here for the first time and am excited to see so much wonderful information. Thank you so much for sharing! I would love to learn more about the uses of dandelion and elderberry. I would love this book, as I am interested in healing. I would love to learn more about plantain, chickweed, calendula and bee balm. I love growing herbs! I have really good luck with basil sage and lemon balm and lemon verbena!! I would love to use them to make my own remedies! I already use them in recipes and for tea! Would live a copy of this book to learn more! Thanks for the recipe too! Thanks so much for the recipe! Sounds like this book will be added to my wish list. I love learning all I can about herbs and making my own remedies. Thanks again! I would love this book! I just want to keep learning and making use of herbs! Thanks for all the great recipes! I will definitely have to try this one as varicose veins get painful. Plus that book sounds lovely! I would love to learn more about Mullen. Pick me! I would love to learn more about wormwood. I love getting your newsletters. I have 4 children and all your information has helped me tremendously. Thanks so much. I would love to learn more about natural home remedies. I’m just getting started and have so much to learn. I am very interested in learning about healing herbs, and would like to learn more about Comfrey. I am literally just starting to grow my own herbs and would like to learn more about calendula and rosemary as well as many many more! Winning the book would help me use these and others in the best way. Would LOVE to win this book. Foundation batch of horehound near my home. How can I use it? 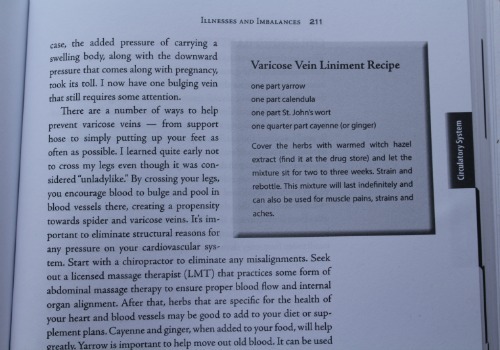 This recipe for varicose veins sounds good. I’ve been using your Violet leaf and dandelion salves also. The book would be a very welcome addition to any person library and herbal remedies . I have began making the majority of all bath, body and home supplies this year. I would love to have this book as a reference to try new recipes and to learn more about incorporating different herbs. I have spider veins, maybe this recipe would help! I would love to win the book! Thank you for sharing your Herbal Liniment recipe. I can’t wait to make it and give it a try. 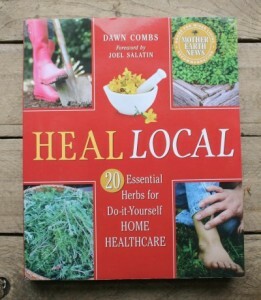 Also, thank you for the opportunity at a chance to win “Heal Local” by Dawn Combs. This book sounds amazing and I would love to add it to my herb book collection. I am very excited to try this recipe. I am a waitress (almost ready to retire as I’m 66 years old) and my legs do give me some grief. I will make this up tomorrow to start the 2 week wait. Thank you so much for sharing this with us. I can’t wait to try out this liniment on my varicose veins. I make most of our bath & body products and would love learn more recipes, especially those using herbs. I love to work with herbs and this book would be a great resource! Thanks for the chance!! I would love to have this book. I have been trying to switch to a more natural way of life, buy buying & making some of our products. We have noticed a big difference with our skin & health in general with eliminating all of the chemicals in our life. I grow Borage and make soap with it but I would like to know more uses for this pretty herb. Love the book and thank you for sharing the recipe! I always make soaps for my family, friends and relatives. Love growing and using herbs. Wonderful post. 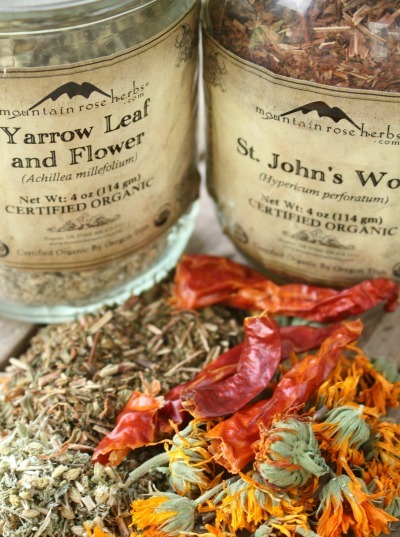 I always enjoy your practical and sustainable approach to herbal healing and home apothecary. This book sounds amazing and I would feel blessed to win a copy. Thank you again for your wisdom and creativity. So many plants grow in my area… it is hard to just choose one! I would like to learn more about yarrow and its benefits. Both types of plantain would be great to learn about too. Thanks for letting us know about another resource. Thank you for sharing, would love to learn more about herbs and how these can be used . Our new greenhouses will be full of herbs come spring. I’m definitely going to read the book. Thanks for the recipe. Good luck with your ventures. Now this is right up my alley!! I love natural remedies! There are so many things growing wild around here that I would love to learn more about…dandelion, comfrey, violet leaves, plantain. Too many to list! More information on this stuff is always a good thing!! Keep blogging!!! I would love to own a copy of this book, there are so many things in the garden that we could be using but don’t. All natural I say that’s the way to go. I am interested in learning more about herbs, any herbs, and what they do and am seriously considering taking an online course. Would love to have this book as an addition to the small herbal reference library I have. Love your blog! Thanks! I would love to learn more about making healing salves with Calendula flowers.. Thank you for sharing you liniment and Echinacea Salve recipes!!!! I would love to win the book as I know it will have lots of other recipes. Thanks for the opportunity! This recipe looks amazing, and I have all the ingredients so I’ll be making it soon. The book sounds great. I would like to learn more about bee balm and yarrow. Thank you for all your valuable information! Could I use this on my spider veins? Hi Mia, Yes, you sure can! I have one on the back of my leg that I got from sitting too much at the computer (when I was a video game addict!) and it is visibly reducing the signs of it. Love this recipe! Ohio surely hides a great deal of treasures! thank you for sharing this!! I’m a newbie and thrive on the information and recipes! it’s even better knowing its local! I am anxious to try the recipe and would love to win the book! Thank you for the opportunity to receive this book. There is so much to be learned. This would be a great resource. I am moving into a house at the beginning if August and cannot wait to start gathering seeds to start my “healing garden” what I can’t grow I will buy. I have been looking forward to this for quite some time. It would be wonderful to have this book as I start on this new journey in my life. Well I hope I win because this is just the sort of remedy book I need, I suffering right now with varicose vein pain. This recipe looks easy and I hope to give it a try. I’m using some essential oils, and some blood remedy tablets. I am intrigued about the rest of the remedies. So if I don’t win, I’ll buy the book. Thanks for the chance too. Just started making soap. have made tinctures and herbal vitamins. doing some basic soaps, we are wanting to do herbal soaps this winter. i would love to win this book!! I would love to learn more about using yarrow and calendula. Thanks for the recipe! I am really into medicinal herbs, and their recipes. This book sounds very exciting. I cannot wait to read this!! After having breast cancer ,both of my breast were removed , I get lots of pain in my breast area because of scar tissue. I feel God gave me a second chance in life and I now I make my own soaps , lotions,etc I control what’s in my products. I would love to have these book to learn more new things .. Good luck to all the ladies..
Just made a batch and can’t wait to use and share. Thank you so for the recipe! The book looks great too. So want to read and use it right now. What a great recipe – love that they are all herbs that are easy to find either by wildcrafting/foraging or growing your own. Looks like a terrific book! Great recipe! I can’t wait to give it a try. I’d love to know what to do with lemon balm. I just found my first blooming yarrow plant in my yard two days ago, and would love to learn as much about it as I can. Right now, I have a ton of chamomile and would like to do more with that. I have lobelia growing all over, also. Would love to have this book!!! Thanks. I am making this morning! So excited I have everything I need. Thanks for sharing! I love to learn more about calendula! Thanks for sharing. 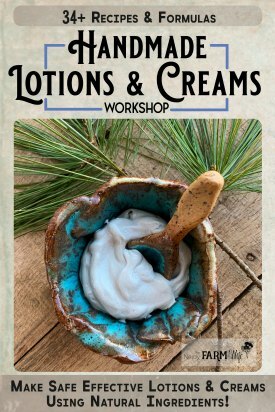 I’m making this liniment today! I would like to learn more about borage. I would love to learn more about the different kinds of mint. Love your site. I would love to know more about dandelion, sage, and plantain. I have just started making my own homemade products. I plant yarrow and lavender, would love to learn ways to use it. Looking forward to planting other things to use, this book would be a great help. Would absolutely love this book! -and – learn more unique combinations and ways to use what already grows on our little parcel of paradise :)! Thank you for this recipe. I am making this liniment today and can not wait to use it:). I have an abundance of Yarrow, Voilets and Salvia growing in my yard, as well as many herbs in my garden. This book looks like a great resource for my family. Thank you. Thanks for the recipe. I like how simple it is. I would love to learn more. Wild oregano is found in my area and it is but one of many medicinal herbs that I wish to study since I have been harmed by modern medicine and am trying to eliminate it from my life. Thank you for the recipe. I am going to order the materials and try it as soon as possible. I would love to win the book. I gave started using herbs and have a lot to learn. Herbal remedies are my passion. Since finally finding our little piece of heaven in the country I’ve been reading everything I can find about homemade remedies and soaking up info like a sponge. I’d love to add this book to my collection. Thanks for the introduction. Lol – I was going to say plantain but I see that is taken! How about Ginko, or oregano, or lemon balm, sage…juniper? I have these all in my garden and would love to put them to use! Am really enjoying your newsletters. I am on Long Island for the summer and and impatiently waiting for the rosehips to ripen and woudl love to learn more about them. I have Chamomile growing and it has a lot of wonderful uses and would love to learn more about it. Thanks for sharing your experiences and recipes. I would like to learn more of catnip. I have a lot growing in our pond area. I do mix it in with herbal tea mixture and tastes great. Would love to learn more about Calendula flowers and mullein. Can’t wait to get a copy of your book. Thanks for all that you do and share. Thank you for all the wonderful recipes. This definitely sounds like a book I need to check out! I would love to learn more about basil. This looks like an amazing reference! Looking forward to trying this recipe since I am getting older and am now developing those unsightly varicose veins. Always get some great ideas from your newsletter and am interested in learning more about herbal remedies. Thanks for sharing. Would love to learn more about Calendula flowers and maybe Catnip the list goes one :) Thanks! This recipe sounds just the thing for my Mom, sister and me. I can ‘t wait to try it. I would like to learn more about arnica and willow. I would love to learn about nettle and marshmallow, I would like to use both in a soap recipe and learn about other herbs that can be used to help people. This looks like a great book. I want to learn more about comfrey. I’d love to learn how to recognize and use nettles! Thank you for sharing about this book. I’ve been learning a new herb every few weeks. I’d like to set my sights next on yarrow. And with soon will be elderberry harvest time so that one will be after this. So much to know!! This sounds like a book I need! We’ve recently moved to a house in a rural area and I’ve been learning about all the interesting plants that grow around us! What a godsend this is! I have been struggling with very painful varicose veins (and can’t afford surgery). I am certainly going to try this liniment! I would like to learn more about comfrey. Thanks for the recipe. I’d like more info on plantain, mullien and bee balm. This liniment looks awesome! I have a ton of yarrow growing around my yard and would love to learn even more uses for it! We have lots of lemon balm that I would love to know what else I can use it for- besides keeping mosquitos away:) We are very much into finding natural cures, and to win this book would be a blessing:) Thanks for the chance to win!! Thank you for the chance to win such a wonderful book. I want to know more about anything, & everything! I’am so fascinated by ethnobotany. Thank you so much for the recipe. I would like to know more about dandelion. I try to use any natural remedies that I can for my family, so I appreciate anything you have to offer. I’d like to learn more about bee balm/bergamot. I love the flavor of the petals of the red flowers and think they would make a very nice seasoning for meat. I know the leaves of the red and purple flowering plants can be used for tea but that’s about all I’m familiar with. Red Clover please – great website too! I love your site and how you make everything so clear and simple for us. Thank you. I would like to learn more about just about everything, but what I have growing free on my place that is useful is elderberry, lemon balm, violet and mullein. I’d love to learn more about Yarrow! I see it in this recipe, but I don’t have any, and I’m wondering if there might be a suitable substitute? Not knowing anything about yarrow makes me wonder what its purpose is in the recipe. Thank you for this opportunity and for any information you can give! Many herbs and ‘weeds’ grow in Oregon…I’m even growing Ginger and Turmeric but…what uses are there for the dried head (after the bloom is done) of Calendula? I have only begun using herbs and essential oils the last year, so I’m verry green (pun intended). I mostly have to use dried herbs. I would like to learn more about using them for natural salves, medicine, and remedy’s. I currently am trying to grow echinacea, lemon balm, and lavender. Would definitely love to learn more about stinging nettle and it’s uses. Thank you! What an awesome birthday present this would be. I am set out to relearn what mother nature has to offer us and being able to use what she has given is always a welcome book in my hands. Thank you, I can’t wait for the read. Hello Jan, I’d like to substitute Chamomile flowers and Peppermint instead of the Calendula flowers and St. John’s wort as I have them at home. Want to use the liniment as well for restless leg syndrome. Do you think that would work? Hi Silke! You could give that a try, though you might get a little bit different results. If you do try it out, keeping the yarrow in and a pinch of ginger or cayenne would be good! but you can also buy a plain bottle of it and rub it directly on your legs. (It can irritate sensitive skin when used directly though, which is why I like it in lotion.) It works so nicely for a few people that I know! Hi Jan, Thank you for your quick response. I read about the lotion first and will try it for sure. Have all the ingredients I need and infused the oil already. Wanted to try infusing the oil and let it sit for some weeks. So know I have to wait a bit longer…..
For the liniment I have the yarrow and cayenne and will make no changes in that. Don’t have the ginger but now I am thinking if should order it too. Thanks for the help! Love reading your posts. Hi Silke, Sounds like you’re all set! You can just use ginger powder from your local grocery store’s baking section, if you don’t want to make a special order for it. It works great in many applications! I am going to give this a try on my varicose veins behind my knees. I clicked on the page to view the book. I read in that recipe that it said ” warmed witch hazel extract”. You didn’t mention that in your copy of the recipe. Can you clarify? Hi Lark! The only thing that warming the witch hazel will do is perhaps jump start the infusing process. I’m not a big fan of heating witch hazel for something you want to store for several months, since it might deactivate some of the alcohol in it (which is its main source of preservative), but others may not feel the same. Either way will work for this recipe though! Hi Jan. I am loving your website! I’m a newbie to the realm of DIY home remedies and looking to formulate for the markets. It’s all been overwhelming…so much research, trial and error (and money) but reading through your site has given me a massive hit of excitement and confidence again. Anywhoos…how does this recipe assist with Vericose Veins? Hi Gina, I’m happy you’re enjoying the site!